Ms. Wyatt is a Michigan licensed social worker, who was the first Black Deaf woman to graduate with an MSW from the Advanced Social Work program at Wayne State University. Prior to this, she completed her BSW at Madonna University. 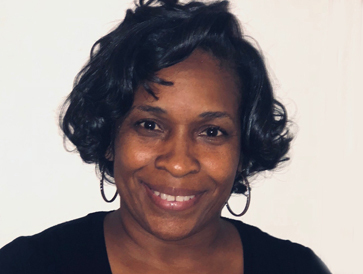 A Detroit native, Ms. Wyatt holds certification as a Trauma and Loss School Specialist, with over 25 years of experience in the field working with Deaf, DeafBlind and Hard of Hearing people. She currently works as a School Social Worker for the Detroit Public School Community School District. Ms. Wyatt’s background includes serving as a Hospice Medical Social Worker for terminally ill patients, providing care and grief support during illness and after death for family members. Ms. Wyatt is an adjunct faculty member at Oakland Community College where she teaches in the Interpreter Training Program. She is the president and co-founder of Deaf Solutions, Inc., an organization that provides innovative and insightful programs to empower Deaf and hard of hearing individuals with the self-advocacy needed to be productive members of society. Ms. Wyatt leads the Women of Destiny program, which strives to provide support, positive inspiration, educational workshops, social networking and mentoring for young Deaf women. Ms. Wyatt has been instrumental in setting up workshops for the Deaf and hard of hearing in the community, focusing on financial management, relationships, and health issues such as breast cancer awareness and diabetes.